Where do i even begin with this. 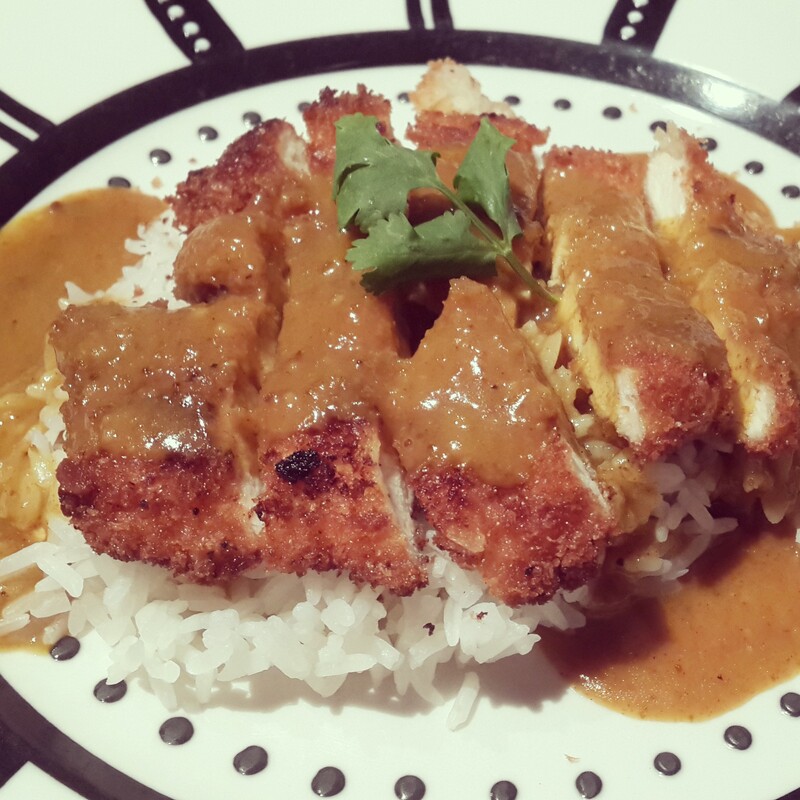 Katsu curry is a Japanese dish that for many like me, was a part of my university days. I remember going to Wagamama in Victoria Station looking like the 436 bus had just dragged me across London, sitting down on those benches and ordering a chicken katsu curry and Asahi beer (hair of the dog, it made sense at the time). It was and still is one of my favourite Japanese dishes. So fast forward maaaaany years and here I am in Cape Town, on the road to recovery (see previous post) and I want a chicken katsu curry! I live right next to a Japanese restaurant… Mind you I think it is important to live near food sources, my previous flat was on top of Eastern Bazaar, which is an Indian canteen-style eatery. Think, having Diamond Plaza (if you’ve been to it in Nairobi) in one big room. The shawarmas, with a hangover; heaven sent! I digress, So the Japanese place next door, I tried the katsu curry there, didn’t get past one bite. It was like cardboard with sludge on top. So I decided to make it myself. Simple right? Now cooking for me, is a bit of a struggle nowadays. Don’t be fooled by my Instagram pictures, I’m functioning on one and a half hands, elbows, teeth and toes… I kid, I kid! But seriously, it takes me a little longer than usual. I also have amazing friends who chop things for me and do the heavy stuff for me. Start with making the sauce. Heat oil in a small pot. sauté the onion and garlic for 2 minutes, add the carrots and sweat for 10 minutes with the lid on. Stir regularly. Add the flour and curry powder and cook for a minute or so. Slowly pour in the stock (pour gradually to avoid lumps). Add the honey, soy sauce and bay leaf and simmer for 20 minutes (reduce the heat at this point). Simmer till the sauce is thick but still able to pour. Add the garam masala. Pass the sauce through a sieve to get it smooth and velvety. If you prefer chunky a sauce then skip this step. To prepare the chicken; start by flattening the breast pieces with a mallet, or if your like me you don’t have one of those, just use a rolling-pin. I covered the chicken with cling film first and then just bashed away. Good for de-stressing, just be sure not to destroy the chicken. Place the seasoned flour, egg and breadcrumbs on separate plates. Coat the chicken in the flour, dip into the egg and then the breadcrumbs. 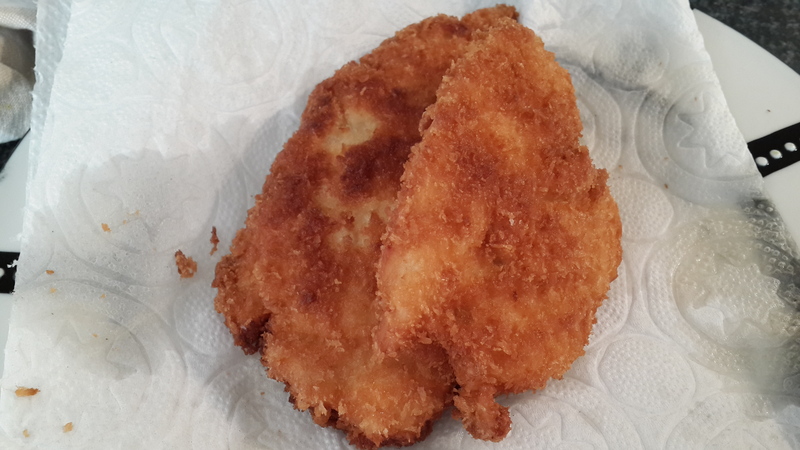 Heat your oil in a frying pan and when the oil is hot enough fry the chicken breasts for about 5 minutes each side. You want it to be golden brown and cooked through. Remove from the pan and leave on kitchen paper. Slice the chicken diagonally and serve with the sauce drizzled over some rice.